Comprehensively renovated in 2017 and cloaked in historical photographs, The Sherman offers a rich combination of old and new with an authentic German ambiance throughout. The number of boutique guestrooms is 22 and no two are alike. Each one is exquisitely designed to refresh and calm. Beautiful and comfortable; very European. Enriched with modern conveniences, the rooms are stylishly decorated with pastel colors, wood floors, marble-tiled baths and walk-in showers, white shutters, and crown molding. All beds have soft linens and firm mattresses allowing pleasant back support and deep sleep. Guests are invited to experience all of The Sherman including the unique Circa 1852 Restaurant with its timber beams, private alcoves, and old world charm. The restaurant offers diners an exotic, refined experience, ideal for celebrating special occasions, yet cozy-comfortable for a casual afternoon or evening get-together. Reminiscent of German biergartens, the recently added Sherman Biergarten features live music every Friday and Saturday night from April through October. With its own menu, great beers, grass-fed beef burgers, and margaritas, it's worth a visit, even if not staying in the hotel. The Sherman will be closing the adjacent streets for one block to host two of the town's largest festivals: Folksfest in May and Oktoberfest in September. The Black Forest Bar, also a new addition, invokes the spirit of the Black Forest region in Germany. Filled with inspiring art, an original Black Forest cuckoo clock and a handmade traditional Bolenhut worn in the region, diners will be looking over their shoulder for wicked witches or Little Red Riding Hood. Don't worry, all the wolves were chased out, leaving just the magic of a great experience. The Sherman offers a variety of options for meetings, parties, or private dining. 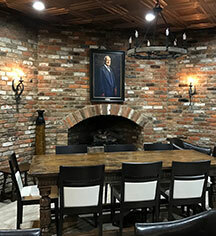 The Hillenbrand room with fireplace ambiance, the Lone Star room with a touch of South Texas, and the Boehringer Hall meeting room provide eclectic, flexible settings for entertaining, inspiring, selling, promoting, dancing, or lecturing. Let The Sherman help host the next event with the perfect backdrop to shine through. The Sherman is located three miles off I74, approximately 60 miles southwest of Indianapolis, Indiana and 40 miles west of Cincinnati, Ohio. 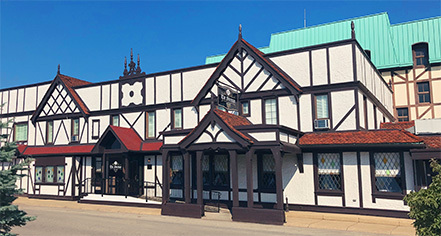 Notable nearby attractions include the Historic Gibson Theatre built in 1921, Batesville Area Historical Society and Museum, Ertel Cellars Winery and Restaurant, Milan ’54 Hoosiers Basketball Museum, the Versailles State Park, and the Art Deco Tyson Temple United Methodist Church, which is listed in the National Register of Historic Places. The Sherman, a member of Historic Hotels of America since 2017, dates back to 1852. The Sherman is named in recognition of General William T. Sherman and the 83rd Indiana Volunteer Infantry, famous for Sherman's March to the Sea (also known as the Savannah Campaign) through Georgia in the American Civil War. The Sherman is a remarkable 22-room boutique destination that has been a favorite respite for weary and hungry travelers since the time of Lincoln. Learn more about the History of The Sherman .